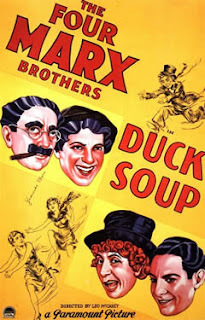 DVD Synopsis: A pointed political satire, Duck Soup is the Marx Brothers' funniest and most insane film. Groucho is Rufus T. Firefly, the hilarious dictator of mythical Freedonia. Harpo and Chico are commissioned as spies by Groucho's political rival, the calculating Trentino (Louis Calhern). The film contains many of the Brothers' famous sequences: the lemonade stand, a masterpiece of slow burn; the Paul Revere parody; the "We're Going To War" number, a beautiful spoof of 30's musicals; the hilarious mirror scene; and a final battle episode that has been copied by everyone from Woody Allen to Mad Magazine. The first time actress Margaret Dumont ever worked with the Marx Brothers was in their highly popular stage production of the 1920's, The Cocoanuts. On that fateful night, the brothers were performing on-stage as Ms. Dumont, standing just off-stage, waited patiently for her cue to enter. She waited…and waited…and waited, for a cue that never came. As would happen many times over the years, the brothers had abandoned the script, unleashing instead their own brand of unrehearsed chaos. The Marx Brothers were renowned for their zany brand of humor, and no film captured their spirit of anarchy better than Duck Soup. It’s hard to say which of the three Brothers gets the most laughs in Duck Soup (the 4th brother, Zeppo, never did get in on the fun). Groucho fires off a slew of one-liners, most of which are aimed right at poor Margaret Dumont, who plays the wealthy widow, Mrs. Teasdale. At a party to announce Firefly as the new leader of Freedonia, Mrs. Teasdale, who was married to the former leader, says that she hopes Firefly will follow in her husband’s footsteps. When Firefly asks where her husband was, Mrs. Teasdale replies, “why, he’s dead”, to which Firefly retorts, “I bet he’s just using that as an excuse”. Chico also gets a few good one-liners in, like when his Chicolini is standing trial for spying on Freedonia. Firefly, who’s serving as judge, says to Chicolini “I’ll bet you 8 to 1 we find you guilty”. “That’sa no good”, Chicolini shoots back in his thick Italian accent. “I can get 10 to 1 at the barber shop”. The ever-silent Harpo, with honking horns and a perpetual smile plastered across his face, gets some of the film's biggest laughs while working at a peanut stand, which happens to be right next to a lemonade stand operated by Edgar Kennedy. Harpo gives Kennedy nothing but trouble; picking his pockets, destroying his straw hat, and in one absolutely hilarious moment, spoiling an entire vat of lemonade by swimming in it. By the time she appeared in Duck Soup, Margaret Dumont had become an old pro. She no longer waited for her cue; she simply stood there like a trooper, absorbing every insult launched her way. If the Academy ever gave out statues for being a good sport, Margaret Dumont would have had a closet full of them. I love this film for so many reasons, not the least of which is Harpo's hilarious scenes at the peanut and lemonade stands. One of the funniest films of all time. Those scenes at the lemonade stand with Harpo and Edgar Kennedy are brilliant. I absolutely lose it when he climbs into the lemonade and starts wading in it...all with a big smile! It's as funny as it comes.